Currently 20,000 nursing homes provide care for nearly two million persons in USA. Today, 69% of people turning 65 years will need some form of long-term care. By 2020, 12 million Americans will need long-term health care for short-term rehabilitation, short-term hospice care, or longer term custodial care. These are typically the ­oldest and sickest geriatric patients and the most vulnerable to geriatric syndromes including polypharmacy, falls, cognitive impairment, and frailty (failure to thrive). Pain and functional impairment related to rheumatic disease are quite common in this population. Assessment of these patients is complicated by cognitive impairment and comorbidities. Pharmacologic management can be challenging, making non-pharmacologic approaches imperative. Interdisciplinary collaboration adds to the therapeutic options and improves function and comfort. AAHSA. Aging services: the facts. http://www2.aahsa.org/aging_services/default.asp (2008). Accessed 2 Feb 2008. McCarberg BH. Rheumatic diseases in the elderly: dealing with rheumatic pain in extended care facilities. Rheum Dis Clin N Am. 2007;33(1):87–108. http://www.mdconsult.com/das/article/body/86217310–2/jorg=journal&source=&sp=1780. Retrieved 22 Jan 2008. 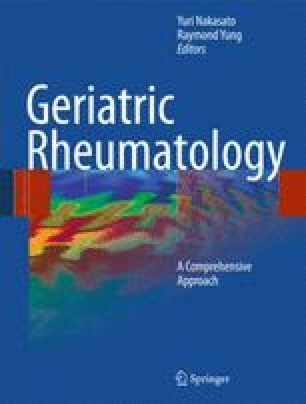 Schwab E. Managing arthritis in elderly patients. Arthr Pract. 2005;1(4):14—23. http://www.arthritispractitioner.com/article/4817. Retrieved 21 Apr 2008. American Pain Society. Practice guideline for the management of pain in osteoarthritis, rheumatoid arthritis, and juvenile chronic arthritis (2002). http://www.ampainsoc.org/pub/arthritis.htm. Retrieved 27 Apr 2008. Rochon P. Drug prescribing for older adults (2008). http://www.utdol.com/online/content/topic.do?topicKey=geri_med/6960&view=print. Retrieved 4 Feb 2008. NCCAM. Energy medicine: an overview. http://nccam.nih.gov. Retrieved 13 Apr 2008. Therapies Natural Treatments Home Remedies. Alternative therapies – natural treatments – home remedies. http://arthritis.about.com/od/alternativetreatments/Alternative. Retrieved 21 Apr 2008. NCCAM. Research report: rheumatoid arthritis and complementary and alternative medicine. http://nccam.nih.gov/health/RA/. Retrieved 21 Apr 2008.